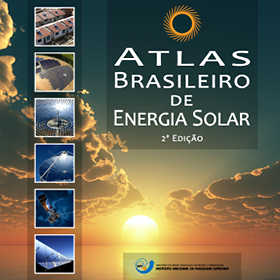 After more than 10 years of its first edition, the Earth System Science Center (CCST) of the National Institute for Space Research (INPE), through its Laboratory of Modeling and Studies of Renewable Energy Resources (LABREN), has the satisfaction to publish the second, expanded and revised edition of the Brazilian Atlas of Solar Energy. This is an example of a cooperative work between INPE and researchers from several institutions in Brazil: the Federal University of São Paulo (UNIFESP), the Federal University of Santa Catarina (UFSC), the Federal Technological University of Paraná (UTFPR) and the Federal Institute of Santa Catarina (IFSC). For this new edition, more than 17 years of satellite data have been used and several advances have been implemented in the parameterizations of the BRASIL-SR radiative transfer model, in order to further improve the reliability and accuracy of the produced database made available for public access. In addition to these advances, the new version contains analyzes about confidence levels, about the spatial and temporal variability of the solar resource, as well as about scenarios for the use of various solar technologies. Although the focus of the Atlas is the energy area, the data presented also serve users in various other areas of knowledge, such as meteorology, climatology, agriculture, hydrology, and architecture. Available for the whole Brazil, for each state, for municipalities' headquarters or specific sites. The database of the Brazilian Atlas of Solar Energy can not be reproduced or copied, in whole or in part, for commercial purposes without the express permission of INPE. There are no restrictions on its use as input for various analyzes, but it is necessary to refer to the source as "Brazilian Atlas of Solar Energy (2017) - LABREN / CCST / INPE (National Institute for Space Research). In the case of software/applications that make use of the database, we ask that the credits appear in the presentation page and any by-products generated with the data (tables, graphs, etc.) also indicate the use of the database. The database is composed of 72272 records covering the entire Brazilian territory. Contains the annual and monthly averages of the daily total of the Global Horizontal, Diffuse, Direct Normal, Tilted Plane and PAR irradiation in Wh/m 2.day. Spatial resolution of 0.1° x 0.1° (approximately 10 km x 10 km). Longitude and latitude define the centroid of the entities or cells of 0.1° x 0.1°. Access to the database is done through download or consultation, being possible to obtain data for ENTIRE BRAZIL, for EACH STATE separately, for the MUNICIPAL HEADQUARTERS and to consult SPECIFIC LOCATIONS. The CSV format is indicated for reading in spreadsheets such as Microsoft Excel and OpenOffice Calc, for example. &bsp; &bsp; &bsp; &bsp; • The field delimiter is the semicolon (;). &bsp; &bsp; &bsp; &bsp; • The decimal separator is the period (.). The SHP format is intended for reading on Geographic Information Systems (GIS). The QGS format is suitable for QGis software users. Contains a working project with the databases of all the irradiations configured with the same color ramp used in the Atlas. How to read data in shapefile format? Find the values of a specific location. Click on the state of your interest. * map derived from IBGE-BCIM 2016.